The universe has a way of leading you towards things, doesn’t it? There are suggestive powers out there that not always subtly lead you towards a decision. You may discover a new holiday destination that you want to try out, and suddenly there are references to that destination in every magazine you read. Also three other people in your workplace have just been there and are full of stories about how amazing it is. They show you pictures of their bare knees propped up on a beach with the ocean in the background (anyone else baffled by that trend??). Then you get an email about holiday deals to the very same place and that decides it for you. Sometimes, there really is no point arguing with the Universe. Over the past couple of weeks, the Universe has been throwing balls at me. Not the type that are made of hard rubber that people more athletic and co-ordinated than I kick around on a field on purpose (also baffling). These are the very same type that for some reason seem to be magnetically attracted to my head and will come flying through the air to give me a concussion, even if I am no-where near the field in question. No, the balls I’m talking about are the smaller, softer chocolatey variety. 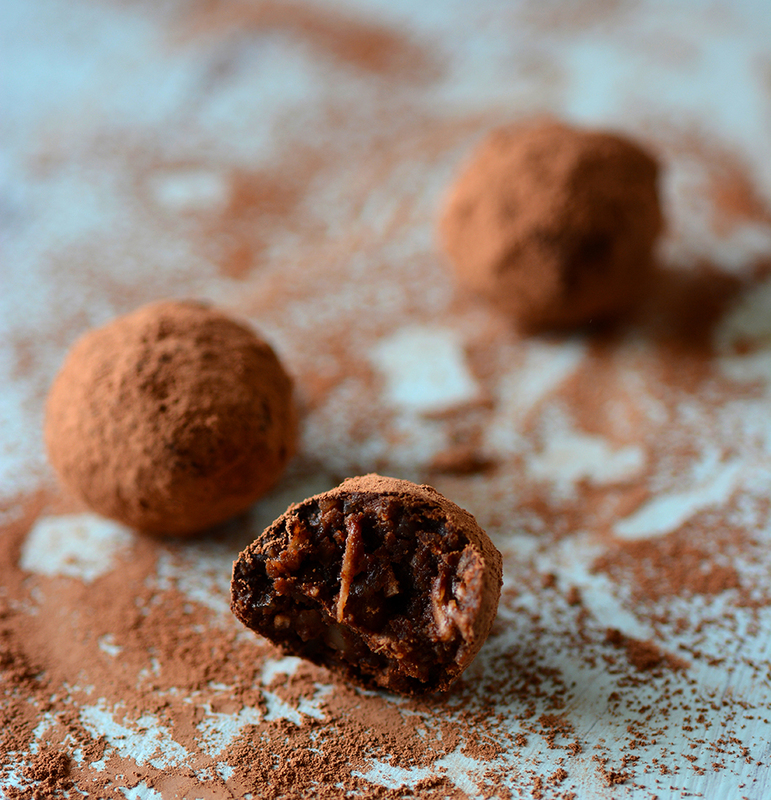 Truffles, if you will, although I’m sure you’ll agree that ‘balls’ is infinitely more fun to say. They are all over the internet, these little spheres of goodness. Here, and here and here. Ohh and these ones! Last weekend my parents had people over and I was asked to make these date truffles, so of course I was already in balling mode. Then there was lunch at Ungaro Raw followed by their divine chocolate truffles. And that did it for me. If the universe wants balls, who am I to deny it? As a lover of texture in my balls (too far? 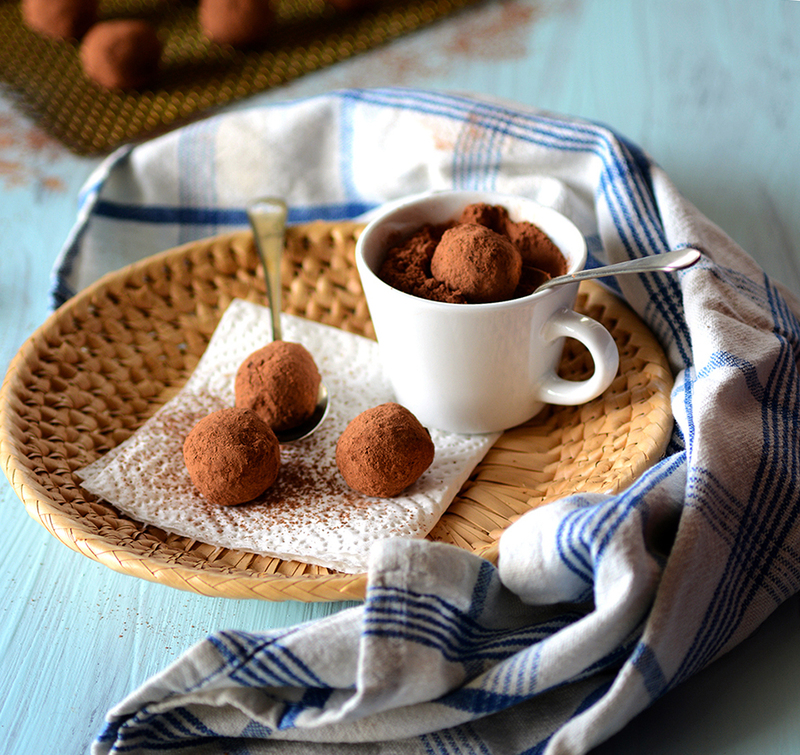 ), I decided to make some chocolatey truffles that were creamy with avocado and studded with shredded coconut and crushed macadamias that would make the eating experience that much more interesting. These are only mildly sweet as I preferred the choc orange flavour to dominate, but you can add more sweetener if you prefer. Before you say anything or make that face, I promise you can’t taste the avocado so don’t let that stop you. I have a box of these in my fridge and I still can’t get them out of my mind. So, I want to know…… what has the universe been telling you lately? Pulse the macadamias in the food processor until they are very coarsely crushed. I stopped when some of the nuts were in a coarse powder but there were still lots of small un-powdered pieces. Place the avocado flesh in a large bowl and mash well with a fork. Sift in 3 tbsp of the cacao or cocoa powder. Add the other ingredients. If using icing sugar, this should be sifted as well. Mix well with a spoon, then with clean hands like a dough. Place the bowl in the fridge for about 30 min. Have a tray or a large plate lined with grease-proof paper. Place 2 or 3 tbsp of cacao or cocoa powder in a food-safe plastic bag, such as a sandwich bag. Oil your hands a little- I used coconut oil. Roll the mixture into balls. I like truffles that are about 3 cm in diameter (roughly a tbsp). 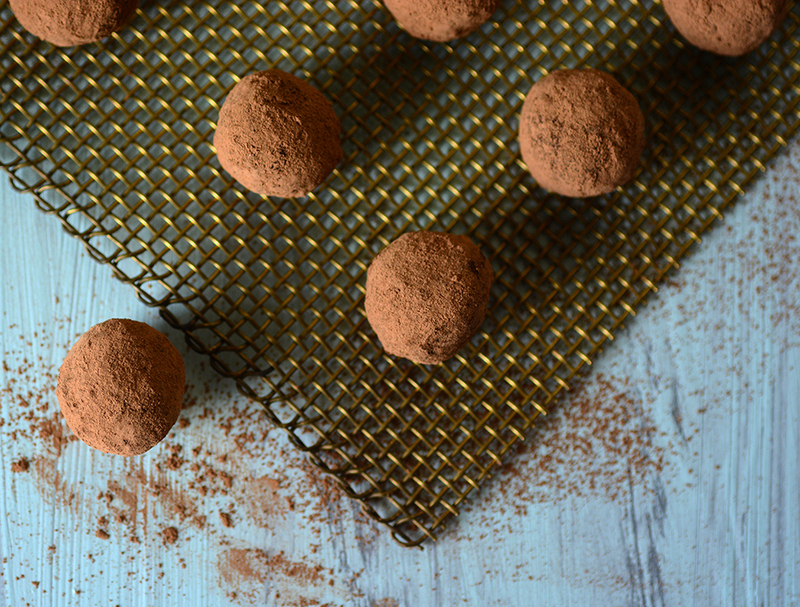 Drop 3 or 4 truffles at a time into the bag of cocoa powder. Hold the top of the bag closed and shake to coat the truffles. 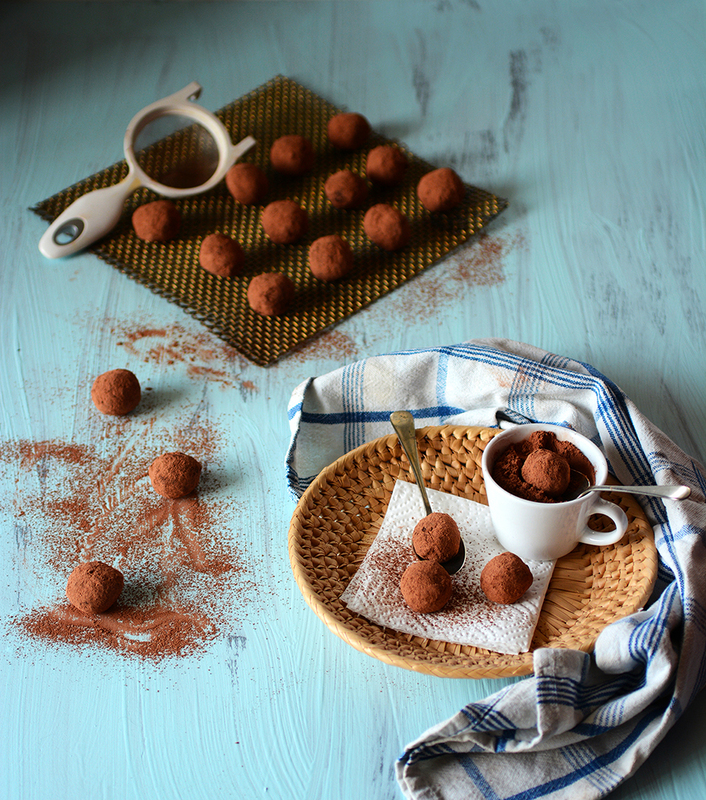 Dust off the extra cocoa powder and place the balls on the plate. 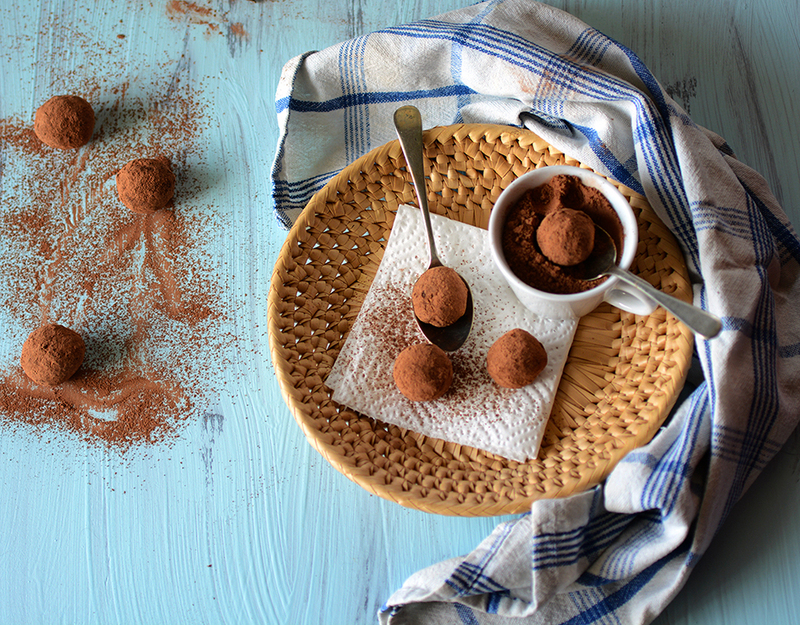 When all the truffles are done, place them in the fridge for at least an hour or so before serving or devouring. These look AMAZING! Any thoughts on what might be a good substitute for milk powder, for someone that has gone dairy free? Hmmmm….I was thinking about this too and think a non-dairy protein powder would work. Or almond meal or LSA maybe, but this would change the texture a little. These look and sound amazing, gorgeous photos! I’m curious to know what the skimmed milk powder does though? Does it improve the texture? Feel like the universe and I are not on talking terms. There has been radio silence these days. I need to tune in more. I agree though , the signs do appear and somtimes that’s soo spooky! I LOVE orange and chocolate flavor! Not just saying that. I live these balls. And awesome pics too. They have avacado in them so I can have a few extra -coz they are healthy right? Oh totally! Trust me, I’ve had many! I just now discovered your site….it’s amazing. 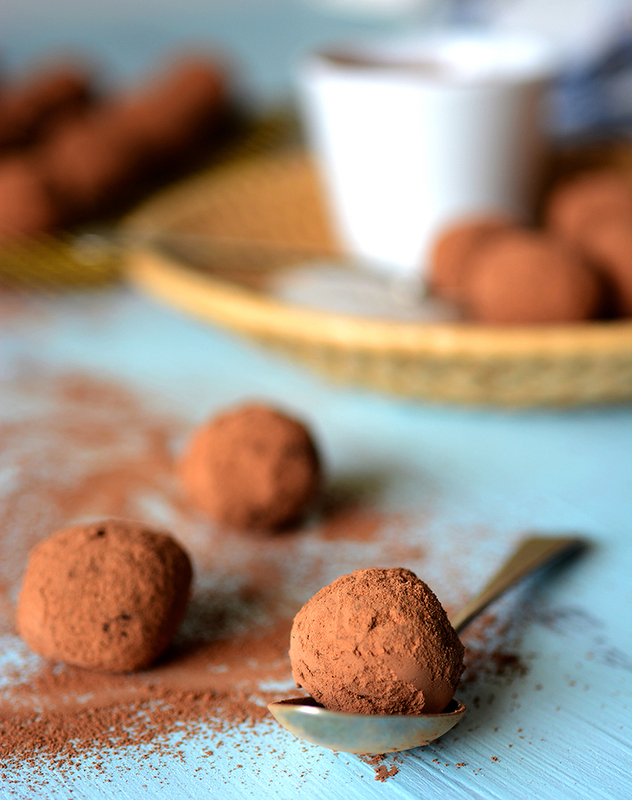 I love love love these truffles. Look soooo yummm!!! The clicks are gorgeous. What a lovely comment- totally made my day. Thank you! OMG, the photos are amazing! Thanks for the recipe, I am going to try these too! Thanks Natalia! Let me know how you like them if you try them. I made them yesterday, changing a little bit the formula….they were gorgeous! Thanks for the idea, I will post them soon! Thank you, Deepa! Yay! Thanks for the feedback and glad you like them. Your photography is just amazing! And these look delicious. I love the mixture of chocolate and orange. Thanks Ameena! You have no idea how much I love hearing that since I’m only just getting the hang of this whole food photography thing. I love your pictures here!! I had to chuckle – because I’ve been using avocado like crazy lately – I’ve made the same recipe SIX times trying to get it just right. Baking with avocado is a different “ball” game. 😉 Love your blue background too!! Thanks Sara! Yeah, I have really developed a taste for the stuff too. Look forward to seeing your masterpiece soon!